The recommendation to continue Apollo on its current path would most likely have been welcomed by the president. As the BOB review was under­way, John F. Kennedy repeatedly made clear his view that the United States should continue its effort to assume the leading position in space. Kennedy’s excitement during his November 16 visit to Cape Canaveral in recognizing that the upcoming Saturn 1 launch would give the United States the weight­lifting lead in space reflected this determination; he referred to that soon-to – be-realized achievement several times in remarks on November 21 and the morning of November 22 as he moved forward with his tragic Texas tour. I think the United States should be a leader [in space]. A country as rich and powerful as this which bears so many burdens and responsibilities, which has so many opportunities, should be second to none. . . We have a long way to go. Many weeks and months and years of long, tedious work lie ahead. There will be setbacks and frustrations and disappointments. There will be, as there always are, pressures in this country to do less in this area as in so many oth­ers, and temptations to do something else that is perhaps easier. . . This space effort must go on. The conquest of space must and will go ahead. That much we know. That much we can say with confidence and conviction. Frank O’Connor, the Irish writer, tells in one of his books how, as a boy, he and his friends would make their way across the countryside, and when they came to an orchard wall that seemed too high and too doubtful to try and too difficult to permit their voyage to continue, they took off their hats and tossed them over the wall—and then they had no choice but to follow them. By the time President Kennedy met on the morning of May 10 with his advisers, including Sorensen, Wiesner, and Bundy; budget officials Bell and Staats; Webb and Dryden from NASA; and Welsh from the Space Council, to review the Webb-McNamara report, his decision to accept the report’s recommendations was almost foreordained. McGeorge Bundy, who was somewhat skeptical of the validity of the arguments in support of setting the lunar landing goal, suggests that Kennedy “had pretty much made up his mind to go” and was not particularly interested in hearing arguments to the contrary.13 It was thus at this meeting that Kennedy finalized his policy decision to go to the Moon. Kennedy did ask the BOB to carry out its normal assessment of the financial and policy implications of his decision before committing to the specific programs and budget recommendations contained in the report. In a July 23 letter to NASA deputy administrator Dryden, Lovell provided more details on his conversations with M. V. Keldysh, president of the Soviet Academy of Sciences. He reported that Keldysh had informed him of “the rejection (at least for the time being) of the plans for the manned lunar land­ing” because of several uncertainties regarding the feasibility of such a mis­sion. Keldysh also said that “the manned project might be revived if progress in the next few years gave hope” that such an undertaking would indeed be feasible. Keldysh was reported as saying that “he believed the appropriate procedure would be to formulate the task on an international basis.” More specifically, Keldysh suggested “that the time was now appropriate for sci­entists to formulate on an international basis (a) the reasons why it is desir­able to engage in the manned lunar enterprise and (b) to draw up a list of scientific tasks which a man on the moon could deal with that which could not be solved by instruments alone.”19 As noted earlier, the Soviet Academy of Sciences had limited involvement in, and knowledge of, the Soviet space program, and particularly its human spaceflight aspects, yet Keldysh’s state­ments were seen by the media and some politicians as authoritative. 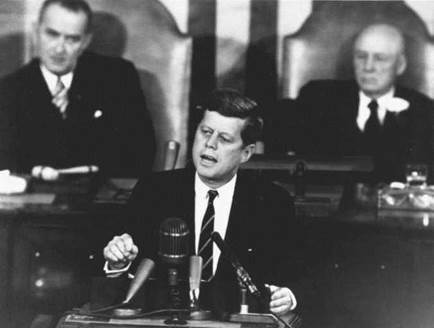 President John F. Kennedy as he addressed a joint session of the Congress on May 25, 1961, and declared: “We should go to the Moon.” Others in the image are Vice President Lyndon B. Johnson (left) and Speaker of the House Sam Rayburn (right) (NASA photograph). President Kennedy’s involvement with the lunar landing undertaking was much more intimate and continuing than is usually acknowledged. Kennedy not only decided to go to the Moon; over the remaining thirty months of his tragically shortened presidency, he stayed closely engaged in the effort and in making sure the benefits of Project Apollo would outweigh its burgeoning cost. Convinced that this was indeed the case, he pushed hard to make sure that Apollo was carried out in a manner that best served both the country’s interests and his own as president. As the authors of the recent study If We Can Put a Man on the Moon… comment, “Democratic governments can achieve great things only if they meet two requirements: wisely choosing which policies to pursue and then executing those policies.” Many presidents since John Kennedy have announced bold decisions, but few have followed those decisions with the budgetary and political commitments needed to ensure success.4 This study details the full range of JFK’s actions that carried Americans to the Moon. This study is the first comprehensive account of the impact of John F. Kennedy on the race to the Moon; others have written extensively about the managerial and technical aspects of the Apollo achievement, but none have portrayed JFK’s perspective as he continued to push, in the face of growing criticism and concern about increasing costs, for moving ahead with the lunar landing program. The book contains a detailed narrative of the decisions and actions of President Kennedy, his inner circle of advisers who made deci­sions and took actions on his behalf, the career White House staff who sup­ported the Kennedy presidency, and the agency heads with whom Kennedy interacted. Kennedy before he was inaugurated assigned his vice president, Lyndon B. Johnson, a lead role in space policy; the study also characterizes Johnson’s role with respect to space decisions during the Kennedy admin­istration. Except when necessary to understand deliberations at the White House level, the book does not give much attention to the specific details of Project Apollo itself. John Kennedy saw his choice to go to the Moon “as among the most important decisions that will be made during my incumbency in the Office of the Presidency.” Yet most general accounts of JFK’s time as president give only passing attention to his involvement with the lunar landing program. One goal of this study is to create as historically complete a record as pos­sible of that involvement. Doing so fills an empty niche in the record of the Kennedy administration. It also provides a detailed case study of how Kennedy went about conducting his presidency, assessing what actions were needed in the national interest, continuously seeking information from mul­tiple sources, but deferring to his agency heads to carry out the programs he set in motion. Readers of this account can decide for themselves what insights Kennedy’s space-related efforts provide about his personality and the way he carried out his presidency. The book’s concluding chapter, however, reflects on the character and quality of JFK’s space decisions, asks whether the way Apollo was conceived and carried out can serve as a model for other large-scale government efforts, and provides a perspective on the impact of Kennedy’s commitment to a lunar landing “before this decade is out” on both the evolution of the U. S. space program and the U. S. position in the world of the 1960s and later. The image of John Kennedy that emerges from this study is at vari­ance from how he is often regarded with respect to space. Rather than a visionary who steered the U. S. space program toward a focus on exploring beyond Earth orbit, he emerges as a pragmatic political leader who soon after entering office came to see the U. S. civilian space program as an important tool to advance U. S. foreign policy and national security goals. He was flex­ible in his approach to space activities, willing to compete if necessary but preferring to cooperate if possible. John F. Kennedy with his actions in the spring of 1961 and in the follow­ing months took the first steps toward the Moon. Eight years later, on July 20, 1969, Neil Armstrong would take another “small step for a man, but a giant leap for mankind.” Historian Arthur Schlesinger, Jr. has suggested that “The 20th Century will be remembered, when all else is forgotten, as the century when man burst his terrestrial bounds.”6 In undertaking the lunar landing program, John Kennedy linked the politics of the moment with the dreams of centuries and the aspirations of the nation. Unfortunately, Kennedy did not live to see the first footprints on the lunar surface, but in the long sweep of history, it is one of the ways in which he will be most remembered. In the early days of the eighty-seventh Congress, two bills related to the Space Council were introduced in the House of Representatives. One was the Eisenhower administration bill abolishing the council, on which there had been no action in the previous year; Sorensen and Bell had agreed during the transition to have this bill reintroduced, and apparently that decision had not been countermanded even though president-elect Kennedy had at least tentatively decided to retain the council. The other bill was introduced by congressman Emilio Daddario (D-CT). It would have not only have autho­rized the president to make the vice president a member and the chairman of the Space Council, but also would have delegated to the vice president executive functions that were assigned by law to the president.5 No legisla­tive action was taken on either of these proposed bills, but the White House wanted to make sure that the Daddario bill did not move forward, since it would have given the vice president more power than Kennedy desired; in addition, such a delegation of executive power to the vice president was most likely unconstitutional. On February 14, Lyndon Johnson wrote to Kennedy, telling him that “in accordance with your request, I have made a study of the National Aeronautics and Space Council.” That study had suggested that “the Council as it now stands has the power to make certain decisions between agencies and pro­grams which is a power that under the Constitution only the President can have.” Thus, “if it is your desire to remove the President as Chairman of the Council, it will be necessary to change the basic structure of the Council so that it coordinates the information—not the activities—of the various space projects and advises you accordingly.”6 Following up on this letter, Moyers asked Richard Neustadt, who was continuing to serve the new administra­tion as a consultant on organizing the presidency, for his thoughts on the organization and operation of the council. Moyers also worked with staff members of the Senate Committee on Aeronautics and Space Sciences to prepare the various documents needed to make the changes in the 1958 Space Act that were thought to be required. Neustadt responded on February 28. He said that he was “much con­cerned” regarding “the Vice President’s position as a constitutional officer who cannot share, so should not be pressed to take on, operating responsibil­ity” that was assigned to the president. In a memorandum on “Organizing the Space Council,” Neustadt noted that “where space programs are concerned, the President should have available the same sort of top-level, politically – responsible advice on policy (and follow through) that he can claim in other fields from a Cabinet secretary,” but that “the Vice President should not be asked to serve as ‘Secretary for Space’ except in the role of senior adviser. It would be unfair to cast him in the role of department head responsible for operations.” Neustadt’s late February critique of an operational role for the vice president implies that at least some on LBJ’s staff, if not Johnson him­self, were continuing to push for such responsibility. With the question settled of how staff salaries would initially be paid, Vice President Johnson could recruit an individual to serve as council execu­tive secretary. On March 20, President Kennedy sent the nomination of Dr. Edward C. Welsh to the Senate; Welsh had been actually chosen for the posi­tion several weeks earlier and had already been actively working on reorga­nizing the council. Welsh was a longtime government employee and was at the time a legislative assistant to Senator Stuart Symington (D-MO). He held a doctorate in economics and had been in charge of Symington’s hearings on air power in 1956, had helped staff LBJ’s Preparedness Subcommittee hearings after Sputnik, and had been the lead staff person for Symington’s hearings on government organization for space in 1959. He had also been the executive director of the task force on reorganizing the Department of Defense set up by Kennedy during the presidential campaign. Welsh had been the primary author of the strident October 1960 Kennedy campaign statement on space, which had argued that “control of space will be decided in the next decade. If the Soviets control space they can control earth.” In Welsh, Lyndon Johnson got a strong, if somewhat self-important, advocate for a vigorous U. S. space effort. As he was under consideration for the Space Council position, Welsh met with James Webb, who told Welsh that he believed in “a vigorous role on the part of the operating agency [NASA] and did not want to have a Council or any other interagency group be controlling the operating day-to-day func­tions.” Welsh told Webb he agreed with this point of view.9 Welsh’s confir­mation hearings before the Senate Committee on Aeronautical and Space Sciences were held on March 23. After Welsh’s opening statements, there were no questions. The Senate voted to confirm Welsh on the same day and he was sworn into office on March 24. Welsh’s first assignment was to draft the changes in the Space Act that were needed to make the vice president its chair and to make other desired adjustments in the council’s membership and organizational location within the executive office of the president. By March 30, Welsh had prepared a memorandum noting that there were three options available to change the provisions of the 1958 Space Act—a reorganization plan, an amendment to the then-pending NASA Authorization Bill, or a separate amendment to the Space Act. Welsh had contacted key members of the Senate and House, and had learned that there was a congressional preference for a simple amend­ment to the Space Act.10 Within the executive office, the BOB still favored a reorganization plan, but such a plan would have had to wait sixty days to allow any congressional comments before it could be put into place. The congressional perspective prevailed, and a decision was made to move for­ward with proposing an amendment to the Space Act. The other issue was the wording of the proposed amendment to the Space Act. Edward Welsh and James Webb had not been able to agree on how best to indicate in the amendment the separation of the functions of the Space Council and the functions of the president. While Welsh wanted to put for­ward a simple amendment that retained the Space Act language that speci­fied the functions of the council, Webb wanted to add a new section to the Act that specified the duties that would remain the president’s responsibility. These differences had been discussed in a March 7 meeting between budget director Bell and special counsel to the president Ted Sorensen, and the decision was made to go forward with the Welsh version of the amendment.12 No change in the name of the National Aeronautics and Space Council was suggested. The secretaries of defense and state, the administrator of NASA, and the chairman of the Atomic Energy Commission remained council members; the one additional government member and the three public members of the council were eliminated, and the council was made part of the executive office of the president. Welsh told Vice President Johnson on April 6 that his version of the pro­posed amendment “had been cleared in the Executive Office of the President with Messrs. Bell, Staats, and Neustadt, and that Budget Director Bell had agreed to discuss the paper with Ted Sorensen and President Kennedy.” He also noted that Representative Overton Brooks had agreed to schedule a hearing on the amendment and that there had been preliminary agreement to the amendment obtained from the staffs of Senators Kerr, Bridges, and Dirksen and with Speaker of the House Sam Rayburn, Majority Leader John McCormack, and Congressman Thornberry of the Rules Committee. The House approved the amendment by voice vote on April 17. Welsh then testified before the Senate Committee on Aeronautical and Space Sciences on April 19, again as the sole witness. Committee approval quickly followed and the Senate approved the amendment on April 20. As he signed the bill amending the Space Act on April 25, President John F. Kennedy stated that “Working with the Vice President, I intend that America’s space effort shall provide the leadership, resources, and determination necessary to step up our efforts and prevail on the newest of man’s physical frontiers.”14 By this time, the Space Council under Vice President Johnson’s leadership was already well embarked on a review that would recommend sending Americans to the Moon. It is unlikely that at this point Johnson envisioned a scenario in which John Kennedy, if elected president, would decide to revitalize the Space Council and turn over its chairmanship to his vice president, i. e., Lyndon Johnson. But four months later, that is precisely what happened.